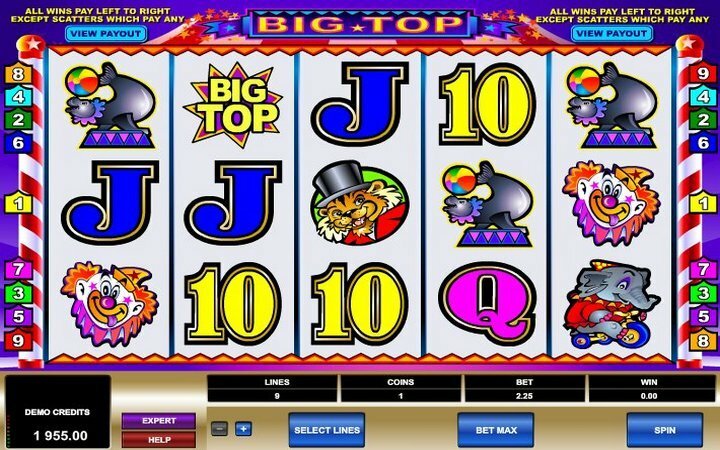 Big Top Slot is a 5 reel and 9 payline video slot by software providers, Microgaming. This circus based slot is among the first from Microgaming, and that is, perhaps, why the game has very little to offer as far as entertainment is concerned. Or maybe their intention was to provide to slot that is straightforward with nothing more to offer besides the base game as it comes. The Big Top Slots game has circus based symbols that include clowns, elephants on bicycles, monkeys, seals that are performing. There are also the usual card symbols from 10 to K, and these have very little payouts. The Big Top symbol has the highest payout with 5000x your wage. The others are between 100 and 600x your wager. The lion wearing a hat has a value of x600 for 5 of them on the reels at the same time. The elephant pays 500x, and the elephant has a value of 300x for 5 on the reels. The card symbols have values of below 100x. The game has very little to offer as far as bonus features are concerned. It has a wild symbol which is the wild clown. The wild clown is different from the other clowns, and it has the word “wild’ written on it. The symbol replaces all other symbols to create winning combinations. It, however, does not have a payout or any multipliers or such wins attached to it. For the wild clown to become wild, it has to appear on reels 2,3 and 4. The scatter feature is also available courtesy of the monkey symbol. The scatters have payouts of 2x, 10x, or 50x if it appears on reels 3, 4 and 5 respectively. The rewards seem so little. The scatter does not trigger any free spins. The symbol does not even create winning combinations. There are no bonus rounds here, and so you will have to make do with the base game to make your money. The games, besides being as bland as it is, has such high minimum bet amounts. The least you can deposit to play is $2.25 which is equivalent to $0,25 per payline for the 9 paylines. This would make it hard for people with low bankrolls to participate in this game. It seems to be reserved for the high rollers. However, you can play Big Top Slots for free to enjoy the gameplay, if that’s possible, without having to part with your hard earned money. Microgaming must have been quite naive when it made this game. That shouldn’t mean that you cannot enjoy the gameplay. You can. Especially if you are not into the side shows that are the bonus features. You can play the Big Top casino games with real money if you like or for free online. Big Top Slot is as black and white (not literally since the circus is such a colorful theme) as they come.